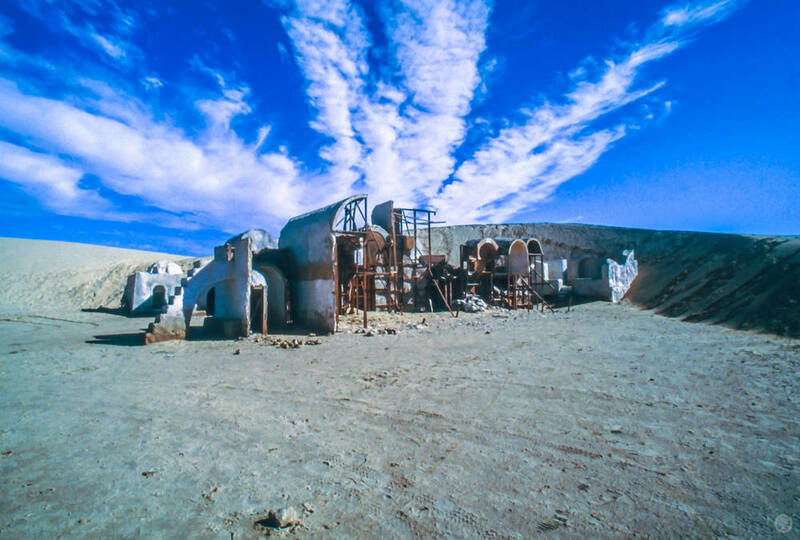 Of all the Star Wars locations I visited in Tunisia, without question the most difficult for me get to was the area used for Mos Espa in EPISODE I - THE PHANTOM MENACE. My research indicated that sets for the fictional town had been constructed on the southern edge of the Chott El Gharsa. I later discovered that they were actually built on the southern edge of the Chott Chtihatt Sghat - a smaller chott just south of the Chott El Gharsa. I had also found out that prior to Ep. 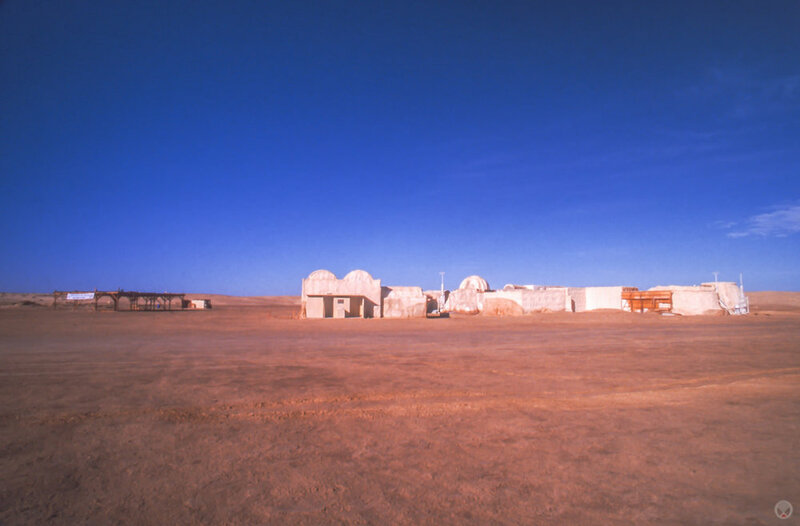 1 filming, an agreement had been reached between Lucasfilm and the Tunisian government whereby the sets would left standing once production had wrapped. After the film was released, several internet reports from other travelers had confirmed this. Through a friendship with one of them, I even had GPS coordinates for the area. What I didn't have was a definitive starting point. And in the absence of a starting point, I also didn't have a vehicle suited to creating my own. Namely something with 4-wheel-drive. Because of this, I spent parts of several days driving around with my GPS receiver turned on, looking for a possible road that might take me out to the location. I eventually found one, but also found it unsuitable for my rented car. During the first few days of my stay, I had come into contact with a local guide named Kamel Rouissi. At the time, he worked for a company called Lovafrica. That was his dayjob. In the evenings, he often liked to hang out at the Residence Warda - the hotel in which I was staying at in Tozeur. Upon learning of my intent to visit Star Wars shooting locations, he of course, offered to guide me to them for a nominal fee. I had very much wanted my research to pay off with the satisfaction of finding the locales myself. However, after failing to find my own way out to the Mos Espa set, I broke down and agreed to let him take me to it instead. The following afternoon (October 24), Kamel guided myself and two French girls (who, like me, were also staying at the Residence Warda) out to the location. With Kamel riding shotgun and the girls in the back seat, I drove out of Tozeur, past a palm grove, and into the (seemingly) uncharted wilds north of the town. They really wasn't uncharted of course. Prior to the filming of EPISODE I, another film had been shot in this location. 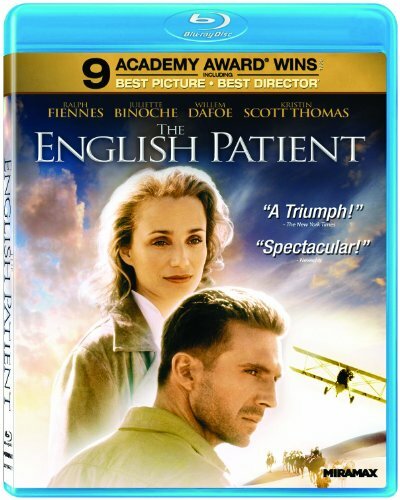 THE ENGLISH PATIENT, winner of 9 Academy Awards (including best picture), had been shot in Tunisia in November and December of 1995 for its 1996 theatrical release. 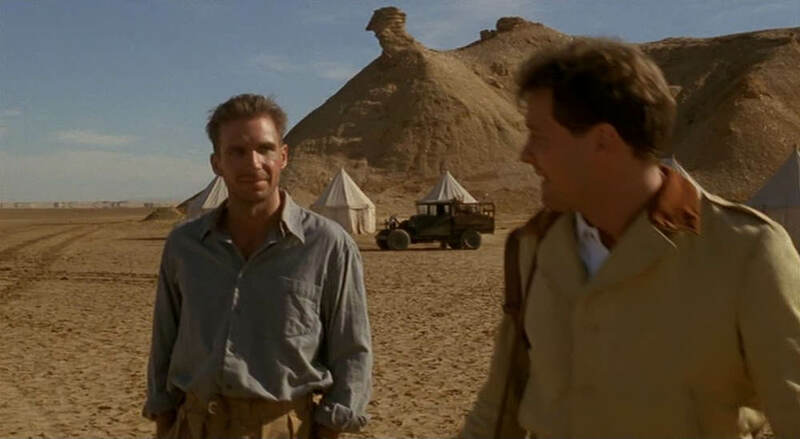 As with RAIDERS OF THE LOST ARK, the Egyptian settings from the film - including Cairo and the Cave Of Swimmers - were actually shot on locations within Tunisia. 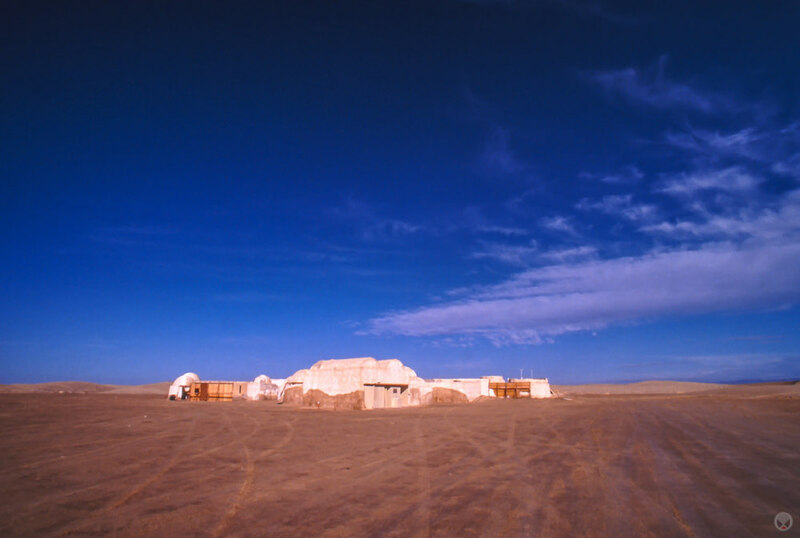 In this instance, scenes in and around the Cave Of Swimmers base camp were filmed very near the same area later used for THE PHANTOM MENACE. The area was much more remote at that time, without an established road to get to the site. So the production crew built one, which they christened the "Saul Zaentz Imperial Highway" after the film's producer (who very recently passed away). It was on this very road that we traveled and after nearly twenty miles, we came to the first location. Onk Jamel (or Onk Jemel, Ong Jemel, Ong el Djemel, Onk el Djemel, etc.) is located on the southern edge of the Chott Chtihatt Sghat. It is a small, but prominent hill that is named for its resemblance to a camel's head. It was here that the Cave Of Swimmers basecamp from THE ENGLISH PATIENT was established. A few years later, a small ridge behind Onk Jamel would become the EPISODE I landing location for Darth Maul's Sith Infiltrator. A few brief shots from THE PHANTOM MENACE would show Maul exiting the ship, scanning the horizon for signs of life, and then sending probe droids out in search of his prey. Later on in the film, one of the probes would return to this location to report back to him and in turn, send him in pursuit. With Kamel and the girls, I was satisfied to make a brief stop at the base of Onk Jamel. I knew that I would likely travel out to this location again during my stay and had surreptitiously turned my GPS on to log the trip before we left. It turned out that the route was direct enough that I didn't need the GPS, but it was fun little experiment regardless. It was a sunny afternoon when we had left Tozeur, but clouds had begun to form by the time we reached the site. The sky would eventually turn completely overcast once we reached the Mos Espa sets and by the time we got back to Tozeur it would be raining hard. But the rest of the week was clear and sunny and I took several opportunities to return and take my time with the locations. The non-movie photos in the gallery below are from those return sessions. Even though we had travelled on an unpaved road to get to Onk Jamel, it had been an easy drive that posed no problems for my budget rental car. However, it was soon to face its greatest test. Leaving Onk Jamel, we travelled a short distance west on the "road" that skirted the Chott. After a mile or so, Kamel motioned south toward a low-lying ridge of sand and directed me to point the car up it. Perhaps the most relaxed and soft-spoken north African I encountered, he casually said, "Plus rapide" as we started to climb. My hazy memory of several years of high school French failed me as he repeated the phrase - each time with slightly more emphasis, but with no response from me. Only after we crested the ridge, did I understand that he wanted me to speed up to get through the thicker sand that lie beyond. "Fast. FAST!" he finally said with a smile. Now comprehending his intent, I put my foot to the floor. But it was too late. The little car initially sailed forward over the sand, but just as soon became overwhelmed and stalled suddenly a few yards from the hard packed surface of the "Saul Zaentz Imperial Highway" we were trying to return to. I managed to get the car stuck in the sand on no less than four separate occasions during my two week journey through Tunisia. This instance was the worst of them. We used the car's floor mats for added traction, but even with three of us pushing, the car simply didn't have enough power to pull itself through the sand. It eventually took Kamel, the two French girls, and local tea stand vendor pushing while I manned the wheel to free the little car that could(n't quite). After a good ten minutes of pushing without effect, a Subaru Outback happened by on the "Zaentz." It slowed as if to offer assistance, but just as it was about to stop, the little Saxo found its courage and jumped forward. I seized the opportunity, again put foot to floor, and soon enough was back on the established road. Once everyone was back on board (including our helpful tea vendor), we followed the Outback's lead further down the road. As it turned out, we merely rounded the next dune to find our man's tea stand among a field of wind-carved formations known as yardangs. I recognized the area immediately as the Tatooine landing location of the Queen's Starship from Ep. 1. On a repeat viewing of THE ENGLISH PATIENT some years after the trip, I also noticed the yardang field visible in the background of several shots. We paused long enough to checkout the yardangs up close, shoot a few photos, and enjoy some freshly brewed mint tea. Then we moved on. Just past the northern boundary of the yardang field, lies the first of the two main Mos Espa sets. 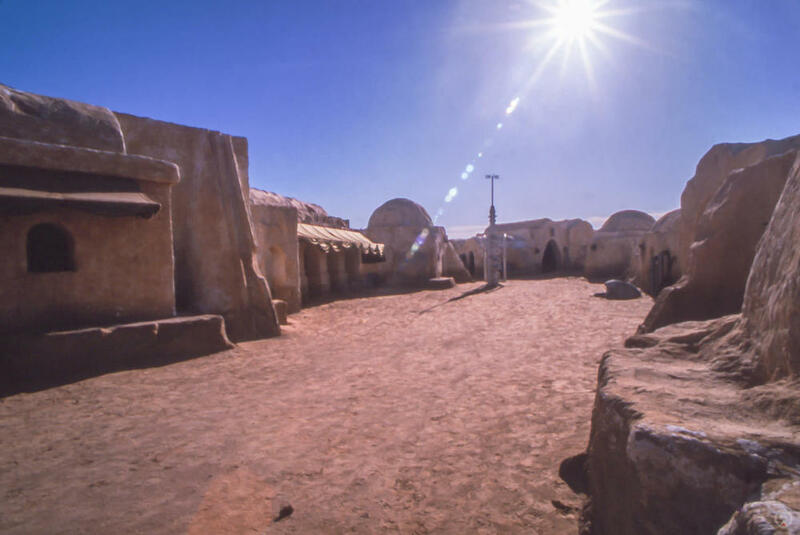 This was the Mos Espa slave quaters set - often referred to by fans as "the small set." It was also the set that was built to mimic part of Ksar Hadada that I wrote about a few blogs ago. It was at this set that scenes of Anakin Skywalker (Jake Lloyd) working on his pod racer were filmed. At the time of my visit, the set - already weathered by the elements - was in the early stages of being consumed by an advancing dune. Within a year or two after my visit, it would be buried entirely. And a few years beyond that, it would re-emerge in pieces. On my first trip out with Kamel and the girls, we only stopped here briefly as the weather was starting to worsen and Kamel was anxious for us to see the larger set. On a later date, I drove out alone and had the entire area all to myself for most of the morning. At the yardang field and at the small set, I saw only a local man with his donkey and a couple of Tunisian youths who I assume were his sons. At the large set, I encountered about half a dozen people during the few hours I spent exploring it, but they didn't linger long. I saw no one at Onk Jamel. It was around 4pm when Kamel, the girls, and I left the small set and the yardang field. The sky was almost completely overcast now and Kamel was anxious for us to see the larger Mos Espa set before the weather worsened. We jumped back on the "Zaentz," drove the big dune at the west end of the yardang field, and then suddenly, there it was: Mos Espa. To my astonishment, a good half-dozen moisture vaporators still stood in its streets. Even though I had known that the Lucasfilm crew had been there the month previous for ATTACK OF THE CLONES, I didn't think I would see much beyond the buildings themselves. 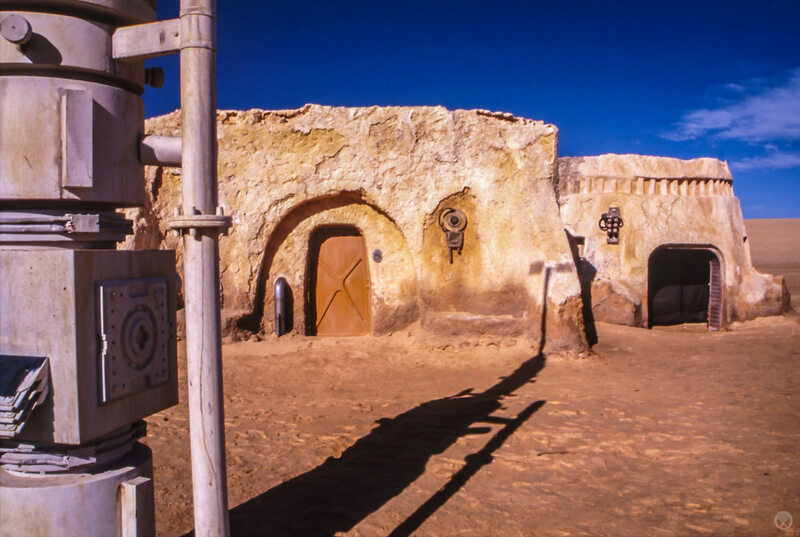 Having visited the Lars Homestead earlier that week, I thought that the vaporators and other bits of set dressing would have been removed from the Mos Espa set as well. But they hadn't! In addition to the vaporators, I found that most of the buildings still retained dressing constructed from metal heating ducts, PVC pipes, water filters, hoses, and the odd bit of (non-functioning) electronic hardware. All of it had been combined in unique and clever ways so that it was more or less unrecognizable from its original Earth-bound function(s). A number of the buildings even had cloth awnings. The buildings themselves clearly drew upon the Mediterranean vernacular style architecture that you can still find a bit of on the island of Jerba. I touched upon that in the first blog of this series, but to refresh, some of the ingredients of the style include arches, domed roofs, heavy buttresses, asymmetrical designs, and, of course, a white-washed plaster finish. At the Mos Espa set, the "white" of the white-wash was really an off-white. This was done intentionally during the initial construction to make the architecture appear older than it really was. We spent twenty to thirty minutes exploring the set as the weather held. Though it looks large on film - and upon first glance feels large when you are there - it really is just a small collection of unique buildings loosely arranged around three main "streets." Once you've had the chance to venture down each avenue, it seems much less overwhelming and very much like the arrangement of buildings you might find in a town from a western. The structures themselves were, for the most part, more than mere façades, but at the same time not quite finished buildings. Most had a complete set of walls, though they usually lacked roofs. Many had doors as well, but they were mostly non-functional. Like the Lars Homestead igloo, these structures had wood framing that was then overlain with wire mesh and a plaster finish. Knowing of my interest in the films and their real-world locations, and perhaps feeling a little bad for having had me drive the rental car out there instead of taking one of his more suitable Land Cruisers, Kamel mentioned he was going to try and find me a souvenir. Soon enough, he returned with a chunk of ... something. It looks like it could have been a piece from one of the vaporators, except that it's slightly darker and I didn't see anything like it on any of the vaporators there. It may have been attached to one of the buildings, but I think that is even less likely. It's made of wood, while most of the architectural details I saw were made from metal, PVC, and plastic. I suspect that it was a part from a larger piece of set dressing that had been removed prior to our visit. With that, we wrapped up our visit and headed back to Tozeur - arriving in town just as it started to rain. As a further thank-you to Kamel, I loaned him my binder of stills for a day so that he could have copies made for use in his business as a guide. Over the next few days, the weather was much improved - glorious even - and I made several trips back out to that location (and others) to explore and photograph at my leisure. When Kamel had finished with the stills, he returned them to me, and I used them to line up shots in the last major location in the area. The spot known to fans as "Star Wars Canyon." In a future blog, I will take you there as well. Under Kamel's directions (from the passenger seat of my rented Citroën Saxo), I drove north out of Tozeur on the same road that skirts the airport's eastern boundary. This road intersects another road that runs east-west in front of a large palm grove. We turned left (west) on to that road and then right (north) on a sandy, unimproved road at the west end of the palm grove. This sandy track heads north, then gradually curves west to run along the lesser salt flats (Chott Mejez Sfa & Chott Chtihatt Sghat) immediately south of Chott El Gharsa. It eventually leads directly to the filming locations some twenty miles away. Alternately, from Tozeur, you could drive to Nefta. Once there, head to the north side of the town and you should have no trouble locating the only road that heads north into the desert. When I was there, I found this road while searching for Mos Espa on my own. I even started to follow it, but turned back almost immediately as it was extremely sandy. I was on my own and had already managed to get the car stuck in roads less sandy than this several times during my travels. In each of those instances, I had been fortunate that there were others nearby to help unstick me. But here (at the time) there was no one other than myself. Judging from what I see on today's satellite imagery, this road has been much improved and possibly even paved. In any case, today it is probably the most direct and quickest route to the Mos Espa set. This area is substantially easier to get to now than it was when I visited in October 2000. Its condition has changed noticeably over the years as well. The impact of roughly 100,000 tourists a year has left its mark in the form of graffiti and vandalism. 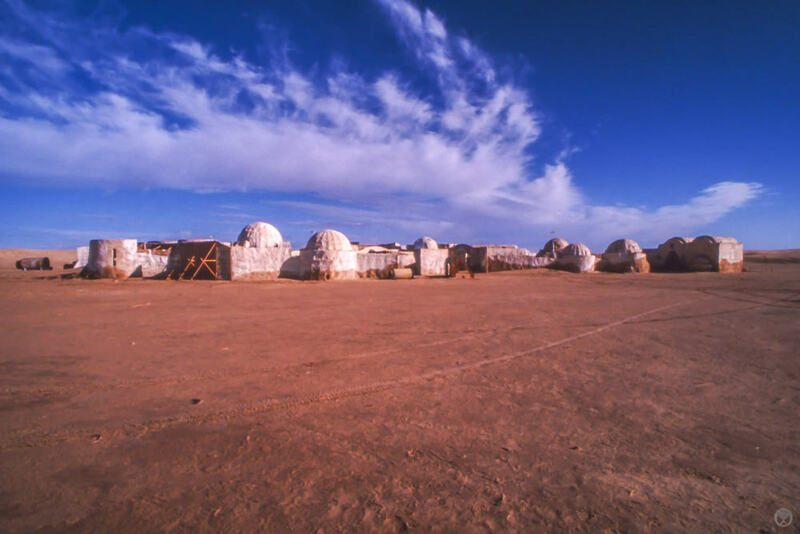 I noticed both during my visit just a few weeks after location filming for ATTACK OF THE CLONES had wrapped at the set. This is not only attributed to careless and/or greedy tourists, but is also very likely a by-product of transient locals who have adopted and adapted parts of the set to peddle souvenirs, escape the elements, or even live for extended periods. 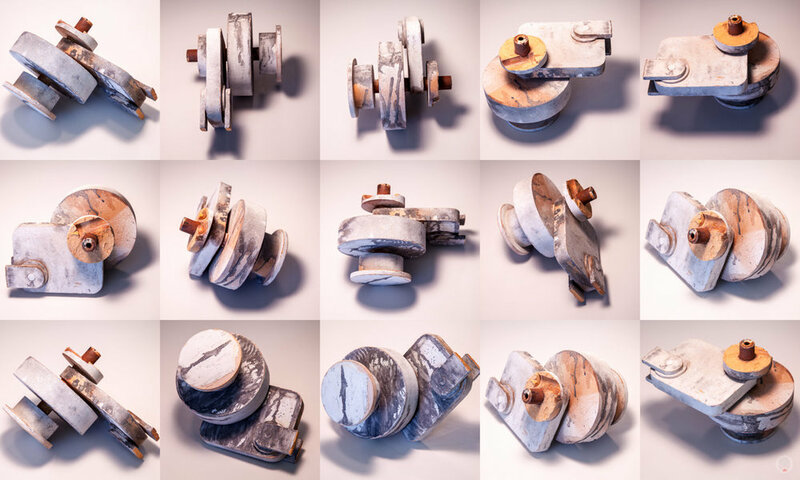 The impact of over a decade of weathering can also be seen in recent photos. The effects of wind, rain, temperature swings, and the extreme desert sun have likely aged the set even faster than the crush of tourists that tromp through it annually. Perhaps the single greatest threat to the set is that of advancing dunes. When I was on site, a large dune lay several hundred yards to the east. Over a decade later, this same dune has now started to consume the set. An even larger one is following it - though at a much slower pace. Google earth today shows the larger dune to be in much the same place it was when I visited the site in 2000. The "historical imagery" slider can take you back in time as far 2004, where it still shows the larger dune in roughly the same position between the yardang field and the large Mos Espa set. This threat to the set became a news story this past summer when a scientific paper (first link in the list below) sparked a succession of articles on numerous websites. Interestingly, in a follow-up piece (the second link in the list), one of the original paper's authors makes the claim that "In fact, a small set used in the shooting of Star Wars Episode 4: A New Hope back in the 1970s had been overrun by a dune a couple of decades ago." The only "set" I can think of from the original film that could have possibly suffered that fate would have been the skeleton that 3PO walks past near the beginning of the film (see my previous blog entry for that one). None of the other sets from the original film were constructed in, or near, sand dunes. Initially, I thought he may have been mistaken in thinking "the small set" from 1999's THE PHANTOM MENACE was from the original 1977 film. However, the scientific paper he co-authored appears to be quite clear (and correct) about that set originating with Episode 1 and being overrun by a dune within the last ten years. So the claim in the follow-up article is (to me) something of a mystery. Since the dune story became news, I have read a number of online comments from fans that suggest saving the set is something akin to a national emergency. Some have even expressed outright anger over the (forthcoming) loss. I suppose if I hadn't already visited it and wanted to, I might be somewhat concerned, but I'm really more surprised that it still stands to this day. After all, it was not built to be a permanent, long-lasting installation and it has now been well over a decade since it was last used in a Star Wars film. One of the overriding themes of Star Wars is that there is never a forever thing. Things change. Time marches on. 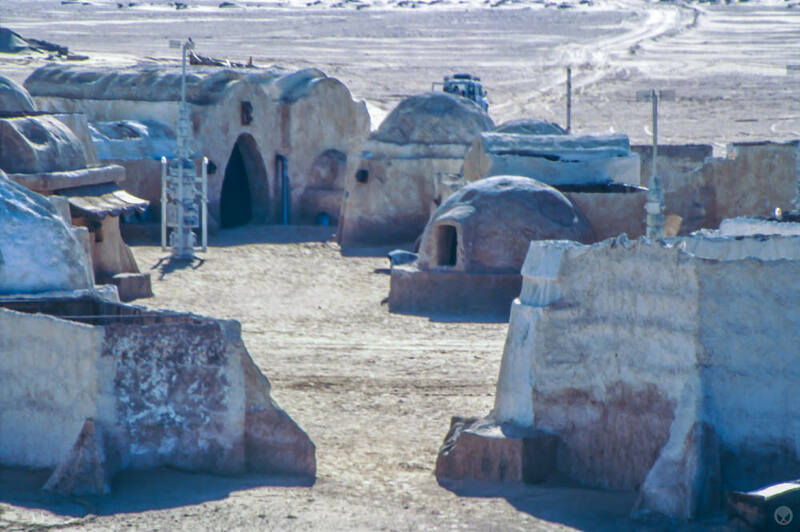 It should be of no surprise to anyone that a film set built in the desert will eventually get reclaimed by it. Next post ... "STAR WARS CANYON"